When you really love something, sometimes it’s best to treat it simply. I really love Brussels sprouts. This recipe I call Korean because I met it back when I had my offices on the river in Georgetown, DC. The closest place to get a carry-out lunch was a hot and cold food bar owned by Koreans, and this was for me the best thing on it. Do not be fooled into thinking I cooked 20 cabbages. The plate is a salad plate which makes it look like my lunch is bigger than it is. They are really tiny cavoletti di Bruxelles. Trim and clean Brussels sprouts (I get 300 gram punnets here) and cut in half. Bring abundant salted water to a boil. Toss in the sprouts. Bring back to a simmer and cook 3 minutes. While they are cooking, mince a small clove of garlic, julienne a small piece of ginger, squeeze about 2 tablespoons of lemon juice over them in a bowl. A pinch of salt, a tablespoon of vegetable oil and a teaspoon of toasted sesame oil goes in and stir. By now your sprouts should have reached 3 minutes. Remove them from the heat, drain and then shock them with cold water. Drain well and toss into the bowl on the dressing. Turn gently. Taste and correct for salt. Let them come to room temperature, then turn them again before serving. They will be fine in the refrigerator for days, but bring them to room temp before eating. The night I arrived in New York, Susan took me to a small restaurant that was recommended by foodie friends. I second the motion. Everything we shared was double-dog delicious and two things were so memorable I resolved to copy them at home as soon as I had a kitchen to work in. The above photo was made in Jane’s Chevy Chase kitchen. We liked this so much we had it again the next day. As a confirmed variety hound, that says something about this dish. If I say there was another one even better, but that I couldn’t make it because we couldn’t get oysters, you’ll know you have something splendid in store. The restaurant is Kin Shop on 6th Avenue between 11th and 12th. They told us to just show up and we’d get a table, because otherwise they had no reservations open until 9:30. We were seated instantly. Can’t argue with that. This was served as an appetizer, and appropriately so, but when I made it for the family, they really just wanted more of this and didn’t feel like moving to another dish. American families just don’t do appetizers very much. It makes a light meal for sure, although you could use more scallops and less greens, but then it could get very expensive. In Italy using more than three per serving could require a mortgage. I consciously altered this recipe to include ingredients one can buy in Italy or that would be normal in an American kitchen. If you live in Asia, this is probably in your grocery sack everyday. Bring the scallops to room temperature and dry them before meal time. Mine took about 30 minutes to get there. Make the sauce by mixing all the sauce ingredients together, finishing with just enough cold water to make it the consistency of heavy cream. Taste and correct the seasoning to suit your tongue. Cut the salad leaves into almost threads. There should be about 1.5 cups of greens and sprouts per person. Just before serving, heat a tiny bit of oil in a frying pan and fry the scallops about 5 minutes total time. I just flipped them around so they cooked on all sides, but they need to be barely done to be good. On a pretty serving platter put the scallops, drizzle a little sauce over them, then cover them with the greens, and drizzle the rest of the sauce over the greens. Sprinkle with chopped peanuts and surround with minced cilantro, if you like it. Using a spoon and a fork, lift the salad onto each diner’s plate. Easy, fast and doesn’t use impossible to find ingredients. It isn’t hot, but does need the hot sauce to bring out the flavors. When an expatriate wants bacon, she must approach a deli clerk who seems to have a willing look about her. The only thing in Italy that’s going to work is pancetta affumicata, but not just any pancetta affumicata. It has to be flat and not rolled. It has to be a bit fatty and not lean. It has to be sliced a bit thick instead of the whisper thin slice they usually make. Not every deli clerk wants to listen, let alone comply. I am sold on the smoked pancetta at my Eurospin ever since I made coucroute garni in October. I boiled a whole one in place of smoked ham hocks and it was absolutely delicious, so when I thought I’d like to make shrimps grilled in bacon, that’s where I went. One rule of getting what you want is not to ask for anything strange when there is a real press of business at the counter. I walked in and saw the deli empty. As soon as the clerk came along I asked her to see the pancetta affumicata that they had that day, explaining that I needed a specific type. As she brought them out to me, another woman came along and stood beside me. I checked the pancettas over and picked one. I started to explain how thick I needed the slices to be, and another woman joined us. The deli clerk made a couple of experimental cuts, and two more women came along. I chose a thickness that was a bit thicker than regular bacon but would, I thought, be acceptable, and she went to a slicer to cut 200 grams of it for me. “What, please, are you going to do with that?” asked the first woman who came along. “I am going to grill shrimps in it,” I responded. “Wait, don’t answer until I’m done,” said the deli clerk as the other women edged in closer. 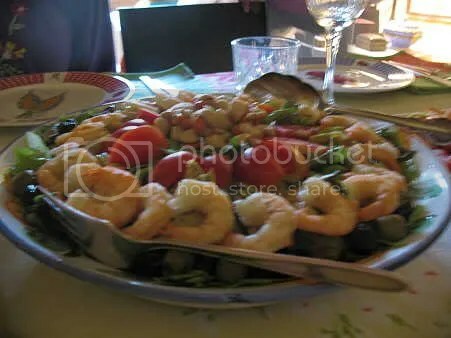 When we were at last all at our leisure, I started to explain wrapping the shrimps, broiling the shrimps, and how I would eat them variously as a canapè/antipasto, a main course or a meal salad. Various breaths were sucked in as Umbrians contemplated eating smoky things and decided it sounded pretty good. Smoke flavored foods are not as popular here as they are in the northern Alpine parts of Italy. There are some supermarkets that don’t carry any smoked foods other than a shrink-wrapped piece of speck or grilling cheese. 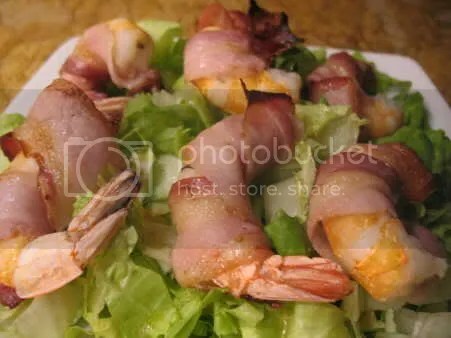 But somehow, the idea of applying a bit of it to a shrimp and dazzling your family appealed that day, and everybody appeared to be buying a bit of pancetta affumicata. It was only two steps to the right to the fish counter. It was good. I hoped they liked it too, but you can’t tell. Unusual flavors are sometimes hard to love. Curiosity and a willingness to try are not Umbrian hallmarks, but that was a gutsy crowd. The salad was great. Promise. Easy and great. Weap the shrimps in smoky bacon and broil one side at a time until just golden, so as not to overcook the shrimps. Arrange on leaves and add a lemony vinaigrette. Diet food ought always to be this good. 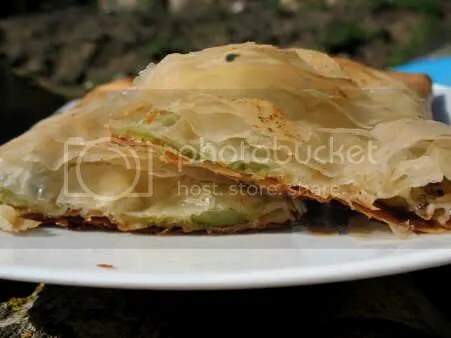 You know how when you open a package of filo pastry sheets, you never can use them all up? Well, now I can. I’ve been experimenting with peach recipes, some of which use filo sheets. There are a lot of sheets in package, so I determined to find a clever way to use them up. Stop right now if you are a food snob and proud of it, because it’s going to get ugly in here. On the other hand, if you can trust me not to guide you wrong, hang on just a minute because this easy little thing is delicious! It looks pretty fancy, too. This is the finished dish sittng on Marcello’s woodpile in the blazing white sun. Have a bite. You know you want to. 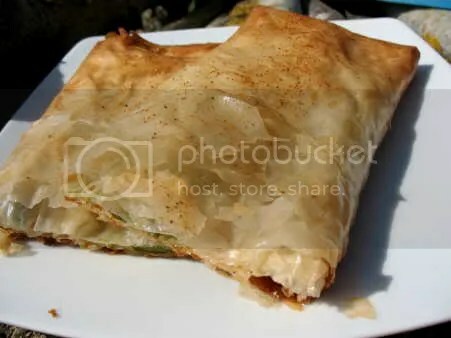 Lay 1 sheet of filo on the counter and splodge it about with melted butter. It does not have to cover it nor be even. Put the second one on top and splodge that one, too. If you prefer, you can use extra virgin olive oil instead of butter, then it doesn’t need to be hot. Lay the vegetables across the filo sheet near the edge near you leaving a space of 1.5″/3.75 cm at the sides. Tear the Kraft Single into 4 strips and add them. Grate the Pecorino over it all. Sprinkle the smallest pinch of salt over all that. Start rolling this into a flattish packet moving away from you. It will be a generous 3″ /7.5 cm wide. 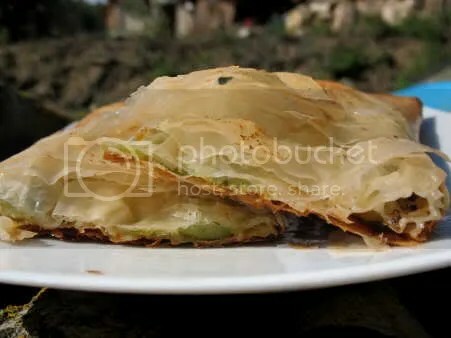 When there is only enough filo to roll two more times, fold the edges in to seal the packet then continue to roll it closed. Brush the top with more oil or butter. Sprinkle sparingly with Cayenne pepper/ peperoncino in polvere or use paprika if you don’t dare the spicy. Put the finished rolls into the oven and cook for about 25 minutes. It should be very golden brown and everything inside should be cooked and gooey with melted cheese. Cut in two and serve hot and crunchy. My friend Patrizia tells me it is food snobbism to reject a product like Kraft Singles if it will do the job better than anything else. In this case, it does. It provides the creamy moisture that steams the vegetables and carries the Pecorino flavor throughout the strudel. I can think of many other vegetables that would be nice in there, and a change of cheese is very possible, too. I almost added blanched Swiss Chard or bietola, but I was happy I stuck with two vegetables instead. Anything cut so that it will cook through in 25 minutes is a possibility. I can only tell you that this was so good I ate it instead of Sunday lunch, and Sunday lunch is a pretty important meal here in Umbria. It would be so easy to make these in large numbers as an antipasto for a dinner party or a really great side dish vegetable. Once they go together they are seamlessly easy to cook and serve and what, I ask you, is prettier than golden crunchy pastry? There aren’t so many of them now. They come more slowly, ripen unreliably and soon, one gelid night, they’ll be over for another year. It’s time to enjoy them for themselves, for what they are, as pure as you can make it. This is an old recipe from my area of Italy, central Italy, where oil rules, but butter happens and no one gets all bent out of shape about it. Well, most people don’t anyway. Heat butter in a heavy frying pan. 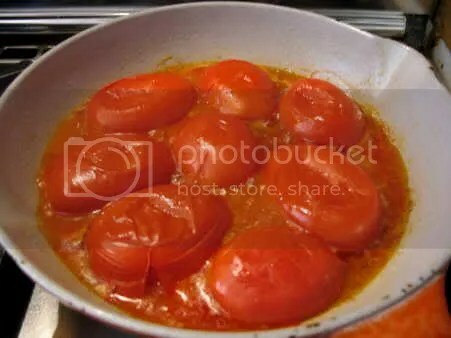 Fry the tomato halves slowly over low heat. freshly grated hard cheese such as Parmigiano Reggiano, Pecorino or Grana Padano. Why no quantities? Because they don’t matter. If you have 3 tomatoes, use them. If you have 13, use them. Up the butter, salt and basil. 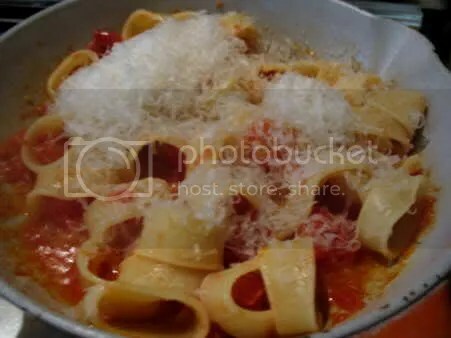 Cook more pasta or freeze the leftover sauce. Wash and cut in half the tomatoes. Proceed according to the photo legends. Comic book cookery, eh? 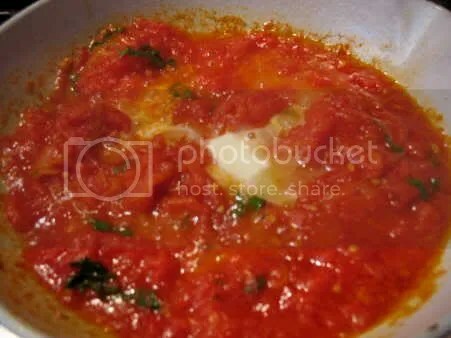 When the tomatoes are cooked, lift off the skins, mash them a bit and add fresh basil pieces. Taste for salt and correct. 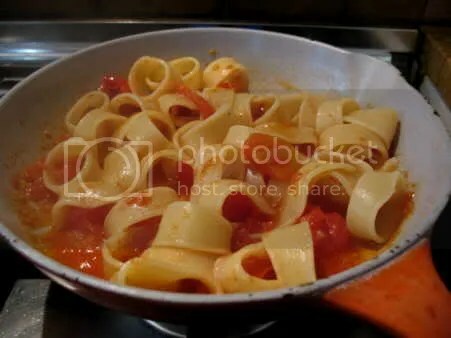 Toss in the steaming hot al dente pasta and cook another minute. The pasta shown is called calimari, and that’s as close as I get to eating octopus, friends. Add freshly grated cheese and toss about. Serve immediately. I’ve made some version of this three times in the past week. It’s never wrong, because it is simply good. I’m going to share this with Presto Pasta Night, but I don’t know who’s the next host yet, so check back. This is making a silk purse from a sow’s ear. It’s not that I don’t like zucchine, tomatoes, spring onions and garlic, it’s that by the middle of August there have been a lot of them, of all of them. It’s like your distant cousin came to stay over a weekend and never left. I came home late from a morning of errands and I was starving. These ingredients were what there was. The dish was delicious! Cut all the vegetables ahead of time. Heat about 1 tablespoon of seed oil in a wok or very large frying pan. Toss in the garlic and onion, stirring to coat them with oil, and then the zucchine pieces. 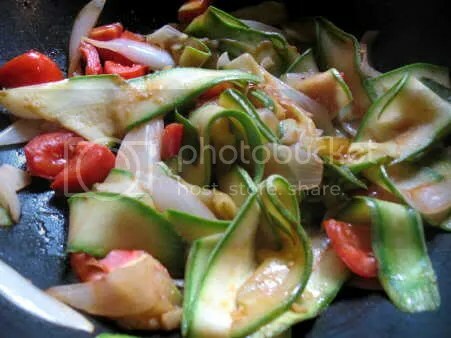 Stir fry until the zucchine starts to warm and cook. It begins to have a translucency to my eye. Salt slightly, then stir in the Hoisin sauce. Turn off the heat and eat with chopsticks. Today is not hot enough to make me want a big salad for lunch. It’s perfectly possible that it won’t get that hot until next summer, but there are never any guarantees in Umbria. 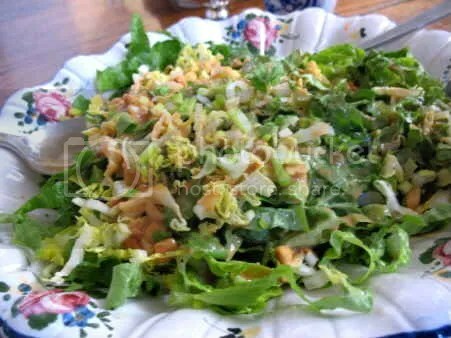 This salad was made when Shelly and Larry came to lunch some days ago. It wasn’t hot that day, either, but we thought it would be. The salad underneath is seasonal greens with various delicious things arranged in patterns on top. There are mild onion bits, marinated artichoke hearts, dry-cured black olives, salted green olives, chunks of ripe tomato, chunks of avocado and slices of cucumber. In the center at the top are flash-steamed scallops from the Isle of Man. This is not an ideal way to cook them, but I was curious. Arranged in a ring are two different kinds of shrimps, peeled and cooked. Mazzancolle is one type and I cannot tell you why they are different. Gamberoni, or “big shrimp”, are the others. It’s very much an arranged salad, meant to look as good as it tastes. The shrimps are prepared with a lime sauce before being arranged on the salad. Mix those things together and toss the shrimps in it as soon as they come off the heat. Leave to marinate not more than 10 minutes. The salad dressing I served is Strawberry Vinaigrette, which has a strong and intriguing scent, but doesn’t alter the taste very much. It’s good, but more interesting than good. Make strawberry vinegar at least 2 weeks ahead. Fill a jar with clean whole strawberries then cover them with cider vinegar. Leave them to marinate the whole 2 weeks and then strain off the beautiful red vinegar and cork it until you need it. Shake it up, baby, and take a sniff. I have to try this with honey one day for fruit salad dressing. I made homemade rolls to go with this and I thought they were warm and yummy. I don’t know why we don’t eat like this more often in Italy.